The Ebola outbreak in West Africa has been in the news a lot lately and has understandably caused some concern among travelers who are considering or have booked a trip to Africa. We want to first of all put your mind at ease. The media has greatly hyped up people's fears and exaggerated the risk of Ebola. 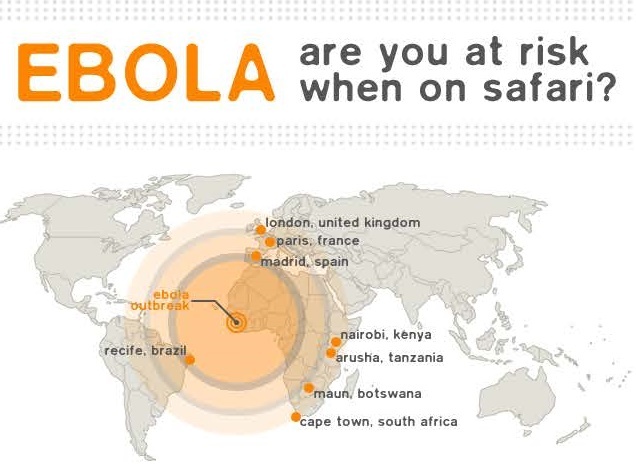 Below you will find a short summary regarding why it is completely safe to travel to the African countries we sell* and book a trip for any time in the future without any worries about Ebola. Secondly, we are very concerned about the wildlife in Africa. If tourism dollars from safari programs aren't keeping the local economy afloat and the locals aren't earning the money they were promised or the salaries at safari camps, they will convert the land for agriculture -- and without land, the wildlife will be overcrowded and die. 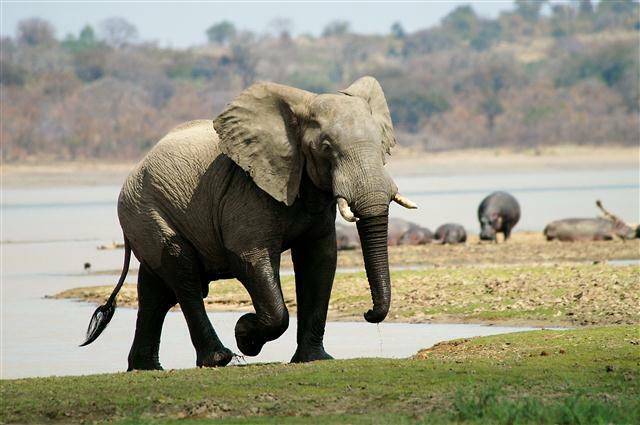 Africa thrives on tourism and the statistics for the African lion, elephants and rhinos are of great concern. We cannot believe that anyone wants to imagine a time when our children and grandchildren can only see the wildlife we see on each game drive only in a zoo, or book or museum. Despite the fact that the Ebola scare is contained in West Africa, the sudden drain in tourism is being felt all across the continent. We are so confident that there will be no Ebola outbreak in South Africa, Botswana, Namibia, Zambia, Zimbabwe, Malawi, Tanzania, Kenya, Ethiopia, Rwanda, Uganda, Seychelles, Madagascar, Mauritius, Mozambique, Egypt and Morocco that we are prepared to amend our standard terms and conditions to offer a guaranteed 100% refund to all clients who have booked with us in advance, and end up having to cancel or postpone in the unlikely event that the Ebola outbreak spreads to one of these countries. An Ebola outbreak must be called and confirmed by the WHO. It is not one or two isolated, imported cases of Ebola from people arriving from affected areas, and merely being treated or quarantined locally. An Ebola outbreak is when there are multiple (two or more) confirmed cases of NEW INFECTIONS that have occurred WITHIN South Africa, Botswana, Namibia, Zambia, Zimbabwe, Malawi, Tanzania, Kenya, Ethiopia, Rwanda, Uganda, Seychelles, Madagascar, Mauritius, Mozambique, Egypt and Morocco (or any adjacent destination on your itinerary booked through us), excluding direct family members or health care workers who have had direct contact with isolated Ebola victims, where the spread of the virus remains contained within the treatment facility and does not affect the general public. 1. That there is a genuine and confirmed Ebola outbreak in the country in your itinerary as booked with Anastasia’s Africa. 2. That a trip postponement is subject to availability for the new travel dates. Your trip can be postponed without penalty for up to 1 year from original date of travel. 3. That you have paid by credit card or bank transfer. If by credit card, we will simply reverse the transaction on your credit card to process the refund less any credit card fees deducted by the credit card company, foreign currency conversion fees and wire charges for deposits paid. If you have paid by bank wire transfer, your refund amount will be subject to deduction of the applicable bank charges and any foreign currency conversion fees. 6. Flights can only be covered by this agreement if you allow us to book refundable or amendable flight tickets for you. With most airlines, their cheapest ticket class is not refundable and allows no changes, so if we are asked to book any of your flights and you insist that we book you on the cheapest available flights, the cost of flights will be excluded from this refund offer.. If we book your flights and you opt not to take the more flexible ticket option, your flights will not be covered by this agreement. 7. This applies only to cancellations or postponements due to a confirmed Ebola outbreak in your travel destination as booked by Anastasia’s Africa. For all other cancellations or postponements, our regular terms and conditions and standard cancellation policy will apply. Why are we so confident? Isn't Ebola very serious? Yes and no. It is serious in three, small, West African countries called Sierra Leone, Liberia and Guinea. 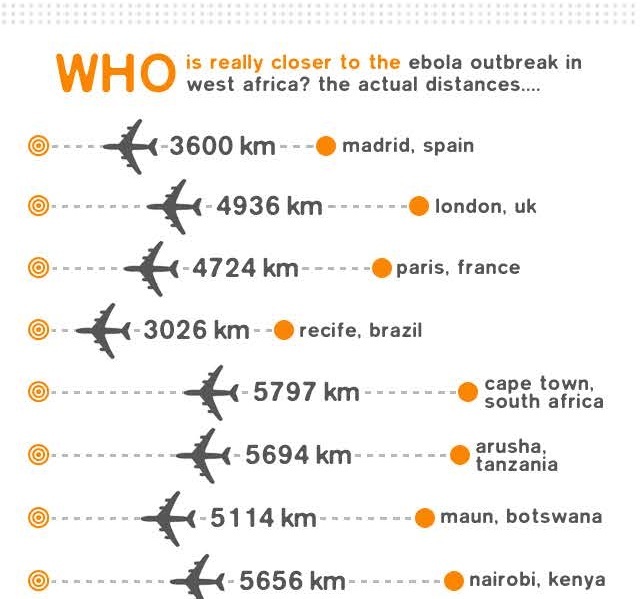 Ebola is not airborne and does not spread very easily. The only people who get infected are those with direct contact with Ebola victims or bodies, such as direct family members or health care workers. You won't get Ebola from someone on a plane – if someone has contagious Ebola they won't even be on a plane. And simply being close to someone with Ebola will not spread the virus. South Africa has been denying entry to all visitors from the three affected nations in West Africa, and actively screens all incoming passengers at all airports. The same is true for Botswana, Zimbabwe, Kenya, Madagascar, Namibia, Rwanda, Seychelles and many other African countries. This means it is highly unlikely that we will see Ebola cases entering East or Southern Africa. At the time of writing, in over 10 months since the start of the outbreak (the first 5-6 months with no screening measures in place) absolutely no cases of Ebola have occurred in Southern or East Africa. This shows how low the risk is and how exaggerated the media-generated fears have been. In the first 10 months since the outbreak, 4500 deaths and 9000 cases of Ebola have been reported, almost exclusively in West Africa. This sounds like a lot, but during this same time, up to 40,000 Americans are estimated to have died from the common flu, and up to 500,000 people are estimated to have died from malaria worldwide. This is not to trivialize the deaths due to Ebola but puts the crisis and figures in perspective. Ebola remains a tiny, insignificant blib on the list of the world's most serious diseases to worry about. 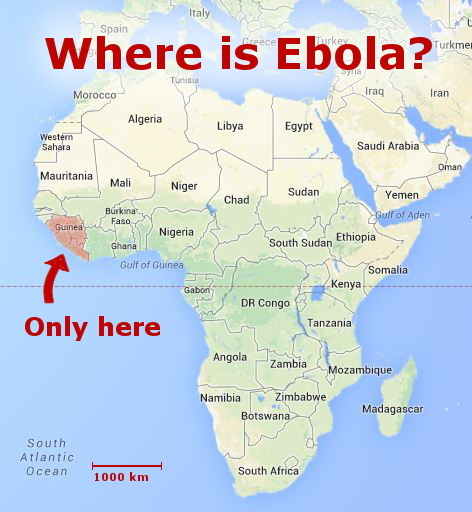 Geographically, cities like Miami, London, Paris, Lisbon, and many other European and American destinations are situated much closer to the center of the Ebola outbreak than Johannesburg, South Africa. Africa is not one country but a huge continent and the distances are massive. Johannesburg has one of the most modern airports in the world, with excellent screening and quarantine facilities. You will be thousands of miles from the nearest Ebola case, and there is no more risk of being infected with Ebola by travelling to Southern Africa as there is from travelling to Europe or the US.With the world's airports and health care systems on high alert now, the chances that this Ebola outbreak will spread to other countries (beyond isolated, imported cases as we have already seen in many countries and have all been contained) is virtually zero. Ebola is nothing new, it has been with us for many years and we have seen many previous outbreaks. It is much less serious than the bird flu epidemic we saw a few years ago, simply because it is not airborne, not very contagious and easy to prevent infection with even the most basic precautions. Our Southern Africa Operations Manager, Jenny Peers, happens to live in South Africa, as do so many of our friends and partners throughout all of Africa and we can honestly say that they have zero fear of contracting Ebola. Not because they are ignorant, but because they are informed. Postponing due to fear of Ebola is an unfortunate waste, not just for us and the local tourism industry in terms of lost revenue, but for the traveler concerned, who will have missed out on a fantastic trip, and may end up spending more money later on to do a similar trip (for example, the South African Rand to US Dollar exchange rate is very favorable for foreign tourists at the moment – South Africa currently offers the best value for money that it has in many years). In closing, our advice regarding Ebola is well-researched and based on WHO fact sheets, not media hype. We've had endorsements from healthcare experts with experience in infectious diseases and public health care. Don't believe the media hype, and don't let the fear of Ebola spoil your African adventure. We look forward to welcoming you on a safe, sunny, Ebola-free safari of a lifetime!